In the big blind, Pearson raised to 700 preflop (blinds were probably 100/200), and Preston called. Having paired his King on the flop, Preston raised all-in, and Pearson, reasoning that it might be a bluff, called. 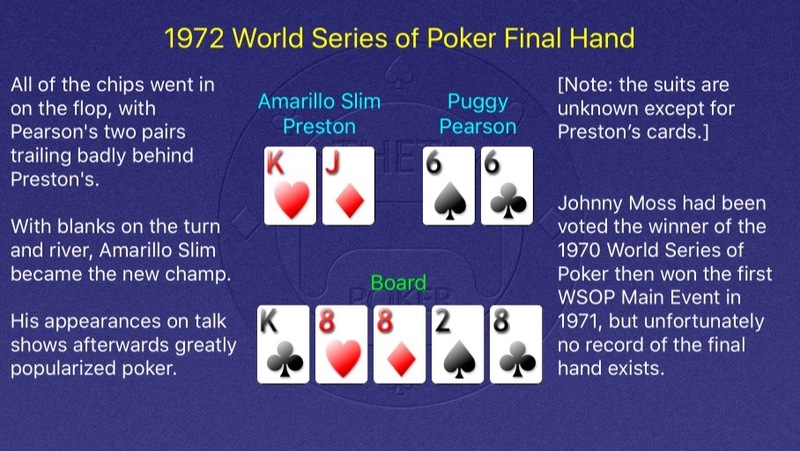 With no Six on the turn or river, Amarillo Slim Preston became the 1972 World Series of Poker Champion and took home $80,000. [LL] “Stan, I just found this cool little book called World Series of Poker Main Event Final Hands1 that I thought you’d like”, Leroy the Lion suggested. [SS] “I’m sure I will!” Stan the Stat concurred. Sadly, like the Poker Greats Playing Card Deck, this isn’t a real product. WSOP Main Event Final Hands are brought to you by THETA Poker Pro, the strongest, fastest, and most customizable Texas Hold ‘Em app for iPhone, iPad, iPhone touch, and Apple TV. [SS] “A handful of 1980s poker festivals that had a $5,000+ event were only held once or twice”, Stan the Stat continued. [RR] “It always seems like such a great idea to host a poker tournament until they realize how much work it is”, Roderick the Rock noted knowingly. [FF] “How could there be? PokerStars, Full Tilt Poker, and Jack Link’s Beef Jerky didn’t exist yet!” Figaro the Fish joked. [SS] “Actually, the dried meat company was born in the mid-80s. But the company grew steadily without any real advertising for the better part of a decade. Sort of like poker. Jack Straus World Match Play Championship November 30 to December 14, 1983 14 Stu Ungar ($64,500) Mickey Appleman ($38,700) finished second, while Gary Lundgren ($19,350) came in third. Ungar ($80,000) also won the highest buyin event, the $10,000 2-7 Lowball, ahead of Sam Nassi ($48,000), Jack Straus ($24,000), and Gabe Kaplan ($8,000). Jack Straus World Match Play Championship November 28 to December 14, 1984 16 Seymour Leibowitz ($42,000) Gary Lundgren ($9,250) came through the loser’s bracket and won a match against Leibowitz in the finals before falling in the deciding heads up contest. The highest buyin event was the $10,000 2-7 Lowball event, where Doyle Brunson ($57,500) beat out Billy Baxter ($34,500) and Chip Reese ($23,000). Rose Cales won the $500 7-Card Stud for $13,000. Knights of the Round Table July 12 to 27, 1987 13 Gabe Kaplan ($108,000) David Baxter ($67,500) was the runner-up, while Berry Johnston ($27,000) finished third and Stu Ungar ($18,900) fourth. Tom McEvoy ($24,000) won the $500 7-Card Stud and T.J. Cloutier ($26,400) the $500 No-limit Hold ‘Em. Jack Straus failed to win an event at his namesake festival, settling for two third place finishes and a fourth. At the 1985 Triple Crown of Poker Classic, which replaced the Jack Straus at the Frontier, John “Austin Squatty” Jenkins won the Triple Crown Award for “outstanding play”, which included the tournaments and the side games. The Knights of the Round Table in Atlantic City included a $200 buyin golf tournament with a $20,000 overlay. Golfers were required to play in at least one poker event to enter. I hereby crown Stu Ungar the King of 1980s Big Buyin Main Events. He won seven of them: the World Series of Poker (1980 and 1981), Jack Straus World Match Play Championship (1983)4 Super Bowl of Poker (1984, 1988, and 1989); and America’s Cup of Poker (1987). Johnny Chan did pretty well too, as he won five Main Events in the decade: the America’s Cup (1983), WSOP (1987 and 1988), and Hall of Fame Poker Classic (1988 and 1989). He also finished second in the 1989 WSOP. Four other players won two titles: Gabe Kaplan (1980 Super Bowl and 1987 Knights of the Round Table plus a third place), Jack Keller (1984 WSOP and 1987 Super Bowl plus two seconds and two thirds), Phil Hellmuth (1988 Diamond Jim Brady and 1989 WSOP plus a second and a third), and Roger Moore (1986 and 1989 America’s Cup). The Jack Straus came the closest, as the 1985 festival was first rescheduled from December to the summer before being canceled. The Triple Crown of Poker Classic was also held in 1986, but the largest buyin events were only $2,500, below the cutoff for this list. Johnny Chan won the $2,500 Championship Event for $90,000. There have been a couple of other unrelated festivals called the Triple Crown of Poker: The Maxim Hotel and Casino held one in late 1994 with buyins ranging from $100 to $500, and the Canterbury Park Card Club in Shakopee, Minnesota held an even smaller one from 2001 to 2004. Unfortunately, all of the results except the Championship Event winner and runner-up have eluded me. This last event, the Jack Straus World Match Play Championship, only had only a $3,000 buyin, but you could use a $3,000 minimum Main Event buyin instead, losing only the 1985 Triple Crown of Poker from this list of 1980s poker festivals. [SS] “Did any of you guys ever visit the Poker Hall of Fame?” Stan the Stat inquired. [RR] “I’ve been to the Basketball Hall of Fame in Springfield, the Baseball Hall of Fame in Cooperstown, and the Pro Football Hall of Fame in Canton but not the Poker Hall of Fame in… Las Vegas, I presume”, Roderick the Rock answered. [LL] “I’ve only been to the Tennis Hall of Fame in Newport”, Leroy the Lion added. [FF] “I actually looked for the Poker Hall of Fame the last time I was in Vegas, but all that Google Maps showed were the Golf Hall of Fame, the Pinball Hall of Fame, and the Burlesque Hall of Fame”, Figaro the Fish bemoaned. [SS] “Well, that’s because it’s not a building. Binion’s used to put each inductee’s photo on a wall, but Caesars Entertainment stopped updating it when they acquired the casino in 2004. So now, the ‘Hall of Fame’ is a virtual hall, a sad little, underdeveloped corner of the web. You can’t even click on the inductees who aren’t players with records in the WSOP.com database. The induction ceremony for the Poker Hall of Fame even used to have its own festival, the Hall of Fame Poker Classic. Binion’s Horseshoe hosted ‘the city’s main winter poker tournament’1 starting in 1988, when Doyle Brunson and Jack Straus were inducted in the Hall. The festival survived until 2002, but only after several interruptions. December 10 to 21, 1988 12 Johnny Chan ($194,000) Jesse Alto ($97,000) was the Main Event runner-up. Jose Rosenkrantz won both the $500 Limit Hold ‘Em ($48,650) and the $1,500 Limit Omaha ($70,800). December 12 to 23, 1989 13 Johnny Chan ($232,000) Jack Keller ($116,000) was the Main Event runner-up. Tom McEvoy won the $2,500 Pot Limit Omaha for $70,000. December 6 to 20, 1990 14 David Mosley Surindar Sunar ($108,000) was the Main Event runner-up. Men Nguyen won both the $1,500 Limit Omaha ($76,800) and the $2,000 Limit Texas Hold ‘Em ($141,600). October 22 to November 7, 1991 16 Lyle Berman ($240,000) Paul Clark ($120,000) was the Main Event runner-up. Phil Hellmuth won the $1,500 Pot Limit Texas Hold ‘Em ($80,400), while Men Nguyen won the $2,500 Seven Card Stud ($71,000). October 27 to November 12, 1992 16 Jim Bechtel ($214,000) Phil Earle ($107,000) was the Main Event runner-up. T.J. Cloutier won the $1,500 Limit Texas Hold ‘Em ($73,200), and Men Nguyen won the $1,500 7-Card Stud ($41,400). December 13 to 23, 1994 14 Barry Schwartz ($184,000) Thomas Chung ($105,800) was the Main Event runner-up. Todd Brunson won the $1,500 Limit Texas Hold ‘Em ($105,600), while his dad won the $5,000 Chinese Poker ($40,000). Howard Lederer won the $2,500 Deuce to Seven Draw ($52,875), and T.J. Cloutier won the $1,500 Seven Card Stud ($60,000). December 8 to 21, 1995 13 Phil Hellmuth ($236,000) Howard Lederer ($135,700) was the Main Event runner-up. Andy Bloch won the $1,500 Chinese Poker ($29,700), Howard Lederer the $3,000 Deuce to Seven Draw ($72,900), and Phil Hellmuth the $1,500 Limit Texas Hold ‘Em ($117,000). August 8 to 27, 1997 16 Kevin Song ($184,000) O’Neil Longson ($105,800) was the Main Event runner-up. Layne Flack won the $1,500 No Limit Texas Hold ‘Em for $67,800. In the $1,500 Limit Texas Hold ‘Em, women finished second (Kathy Kolbert; $30,705), third (Veronica Holmes; $16,020), and fourth (Linda Ryke Drucker; $9,345). In the 1995 Main Event, Hellmuth was down to his last 1,000 chips at his starting table. Men Nguyen and Jose Rosenkrantz won the most events overall with four each. T.J. Cloutier, Phil Hellmuth,3 and Monte Kouz each won three. The 1992 event almost didn’t happen. The IRS wanted players to report their gambling income, and tournament director Jim Albrecht pulled in all his resources to reach a compromise after three days. The result was that poker players now need to fill out W-2G tax forms, but no prize money is withheld. The festival nevertheless returned in 1994 when the casino was suffering from the construction of the Fremont Street Experience. The Classic was canceled again in 1996, this time because the National Finals Rodeo needed more hotel rooms. That problem was solved in 1997 by moving the festival from December to August, but that time of year proved less popular. Source: The Reno Gazette-Journal, September 2, 1993, page 20. The Hendon Mob database also claims that John Juanda won the $500 Limit Omaha Hi/Lo, but the more reliable World Poker Rank indicates that Hoang Ta was the winner. This rec.gambling.poker report confirms Ta’s victory. Various sources, such as Poker-Story: Phil Hellmuth Jr. the Bad Boy of Poker claim that Hellmuth has won five Hall of Fame Classic tournaments, but none back it up with a list of the events he’s supposed to have captured. The only result that I’m missing is the December 14, 1988 $1,500 Seven Card High, which he probably didn’t play in let alone win. [SS] “Do any of you know who Diamond Jim Brady was?”, Stan the Stat inquired. [RR] “Wasn’t that the guy who was paralyzed during the Reagan assassination attempt in 1981?” Roderick the Rock. [LL] “I thought he was a writer for the New York Post“, Leroy the Lion suggested. [FF] “Was he one of the relatives on The Brady Bunch?”, Figaro the Fish guessed. [SS] “That’s him! James Buchanan ‘Diamond Jim’ Brady was a salesman who was so good at his job selling railroad equipment and steel that he became a multimillionaire. He wore diamonds to broadcast his success, and, as you’ve already guessed, he was known to play a little poker. His New York City home featured a game room with a pool table, a roulette table, and several faro and poker tables. October 26 to November 3, 1985 11 n/a The festival had no ‘Main Event’ per se. There was a $5,000 buyin Limit Low Ball Match Play event, but the ‘Grand Finale’ was just a $1,000 buyin Limit Lowball tournament. David Sklansky won the Best All-Around Player prize, a 10-day trip for two to London and Paris, with five final tables, including two seconds and two thirds. November 15 to 24, 1986 11 n/a This festival also ended with a $1,000 Lowball event, won by Kathy Burkes for $53,800. Women also won the Media/Celebrity warmup event (Sally Sander) and took second in the $300 Lowball Draw (Sun Chin Braget, $18,320) and third in the Super Pan 9 (Susan Chang $1,860) and the Finale (Barbara Enright, $9,280). David Hayano captured the Best All-Around Player title when he reached the last three of the Finale. November 7 to 22, 1987 18 Buster Jackson ($75,000) Men Nguyen won the $300 7-Card Stud Hi-Lo for $28,600, Gary Berland won the $300 Limit Hold ‘Em for $70,890, David Reese won the $2,500 Deuce-to-Seven Lowball for $37,500, and Johnny Chan won the $1,000 Half Hold ‘Em/Half Lowball for $61,340. August 6? to 21?, 1988 18?4 Phil Hellmuth ($125,000) This was Hellmuth’s first major tournament victory, nine months before he would win the WSOP Main Event. He also made a deal to split $144,000 with Erik Seidel in the $1,000 No Limit Hold ‘Em, although Seidel won the event. Poker Player newspaper claims that this was the first big non-smoking poker tournament,5 one of George Hardie’s many accomplishments. August 5 to 31, 1989 23 Bob Veltri ($240,000) David Reese ($150,000) was the runner-up in the Main Event, while Phil Hellmuth ($78,000) finished third. Don Williams won the $300 7-Card Stud ($61,000), the $1,000 Pot Limit Hold ‘Em ($81,000), and the $1,500 Lowball & Hold ‘Em ($81,800) events. Mike Hart won both the $300 Jacks Back ($41,160) and the $300 7-Card Stud, Hi-Lo Split ($44,100) events. August 4 to 31, 1990 20 T.J. Cloutier	($256,000) Mansour Matloubi ($160,000) was the Main Event runner-up. John Bonetti won both the $1,000 and the $300 7-Card Stud Hi-Lo events ($39,200 and $38,160). The top 40 players received prizes in the All-Around Championship, including Seymour Leibowitz taking home a red Corvette and Humberto Brenes $10,000. August 3 to 30, 1991 21 T.J. Cloutier	($230,000) Hans Lund ($115,000) was the Main Event runner-up. Other notable winners included Men Nguyen ($500 7-Card Stud Hi-Lo; $27,800), Howard Lederer ($1,000 Limit Hold ‘Em; $41,000), and Barbara Enright ($1,500 7-Card Stud; $45,000). August 1 to 30, 1992 18 T.J. Cloutier	($126,000) Bobby Hoff ($78,750) was the Main Event runner-up. Other notable winners included Men Nguyen ($1,000 Pot-Limit Omaha High; $39,600) and Barbara Enright ($1,000 Limit Hold ‘Em; $49,600). August 21 to 31, 1993 17 Todd Brunson ($198,000) Following this, his first major victory, the 24-year-old Brunson dropped out of college to follow in his father’s footsteps and become a poker pro. Peter Vilandos ($123,750) was the Main Event runner-up, while Berry Johnston ($47,025) finished third. Other notable winners included Carolyn Gardner ($300 7-Card Stud; $30,200), Men Nguyen ($500 Lowball Shootout; $22,320), Phil Hellmuth ($1,000 Omaha Hi-Lo; $50,000), and Marie Gabert ($1,000 Limit Hold ‘Em; $46,400). August 6 to 31, 1994 18 Vince Burgio ($164,000) Thomas Chung ($102,500) was the Main Event runner-up, with Mansour Matloubi 3rd ($49,200), and T.J. Cloutier 4th ($28,700). The highest buyin event was actually the $10,000 Dr. Jerry Buss’ Celebrity ‘Go for the Gold’ Tournament Half Hold ‘Em, Half Stud, which Bab Veltri won for $166,800. Tom McEvoy, who captured the $1,000 Limit Hold ‘Em for $41,200, won the All-Around Championship for another $40,000, including a Lincoln Mark VIII. Other notable winners included Ted Forrest ($300 Omaha Hi-Lo; $26,680) and Erik Seidel ($1,000 No-Limit Hold ‘Em; $75,600). The 1985 festival paid out more money in prizes than every prior festival except the World Series of Poker. In 1985 and possibly other years, Hardie himself dressed up as Diamond Jim Brady, and hostess Hope North posed as Lillian Russell. Players were offered free personalized photos with the ‘famous couple’. The Main Event started with a $5,000 buyin in 1987, increased to a $10,000 from 1988 to 1991, then returned to a $5,000 from 1992 to 1994. Over the decade George Hardie won three events in his own festival: the 1985 $2,500 Match Play Limit Lowball ($20,000), the 1987 $1,000 Razz ($27,000), and the 1993 $500 Hold ‘Em Shootout ($33,360). White House Press Secretary Jim Brady was known as “Bear”. Pan-9 is a blackjack-like limit poker game using eight card decks from which the Eights, Nines, and Tens have been removed (310 cards). You try to draw to total of 9, with Aces worth 1, face cards worth 0, and other cards worth their number. After each player antes, the dealer gives each player two cards face down. There follows a round of betting in which you can check, bet, call, or fold but not raise. An optional third card is dealt to each remaining player face down followed by a double-stake betting round. An optional fourth card is then dealt to each remaining player followed by a quadruple-stake betting round. Pai Gow Poker is one of the games that led to Chinese Poker. Each player is dealt seven hidden cards, which they sort into a hand of two cards and a better hand of five cards. Players who can beat both of the dealer’s hands win, and those who lose both hands lose their bet. Otherwise, it’s a push. On June 28, 1986, the Bicycle Club opened the Dragon Room, a special area for high rollers to player Pai Gow Poker and Super Pan 9. Details on the 1988 tournament are scarce. Even the Hendon Mob database has information on only four events. Despite his other vices, Diamond Jim Brady neither smoked nor drank, so this milestone was quite apt. 1992: 2nd Bobby Hoff ($78,750), 3rd Hal Kant ($37,800).